You might be familiar with WordPress back end login where you generally login by entering wp-admin after the site name. WordPress back end login is highly flexible, letting you add various restrictions and additional features such as spam protection by implementing its filters and actions. Also it offers highly secure features to let users log into your WordPress site. However, back end login is a separate component from the WordPress site and hence novice users may have issues navigating between front end and login of the site. Many web applications and sites may prefer front end login instead of ugly back end login to give better experience to the users. WordPress doesn’t have a built-in front end login system. It does provide a function called wp_login_form that can be used to display the login form on front end. However, functionality is very basic and redirects to back end login form on errors . In this article, we are going to explore the most important features of a WordPress front end login system as well as optional features that provides additional value to enhance your login section. WordPress front end login functionality is provided by third party plugins and themes. They have come up with their own front end login implementation for WordPress. These plugins handles login features in different ways and its important to know essential features of WordPress Front end Login plugin before you choose a plugin for your website or application. Let’s look at the following screenshot to understand how we can place front end login forms within the website, instead of going to completely different backend screen. Front end login for WordPress is very important as it gives you following features. Customize the design according to your theme styles. Ability to place single or multiple login forms anywhere in the site including within pages, sidebars, header and even navigation menus. There are plenty of free and premium plugins providing front end login forms for WordPress. Before choosing such plugin, you need to understand the essential long term features as its difficult to switch plugins. In the next section, we will be looking at the most essential and optional features provided by WordPress front end login plugins. Front end login can have many major and minor features. You may not need all features of such plugins. So its important to know the exact features you want and check matching plugins before you decide to use them on your site. First, let’s look at the most important aspects of front end login plugin. Authenticating user into WordPress site is a very simple task where we have to only set an authenticated cookie. So many plugins uses their own techniques to handle the login. But its important to use WordPress backend sign-in procedure in front end using wp_signon function to keep compatibility with other plugins and securely authenticate the user. This function checks all the necessary security checks before allowing user to login, where some plugins might be using their own functions without these validations. Therefore, I recommend checking this feature before using plugins. WordPress executes some actions and filters within the login function. You can check them inside wp_signon function of wp-includes/user.php file. Generally, you need to use several plugins to build a advanced site. So other plugins may be using those filters and actions to add some functionality in their plugin while user is login. If we don’t have those actions and filters within our login functions, we may get conflicts with other plugins. So it’s important to check whether default WordPress actions and filters for login is supported by your front end login function. Once you enable front end login, you will notice that lot of spam users or programs trying to login to your site. So its a must to protect your login from spam users. Captcha verification is the most common way of preventing spam logins. You won’t get captcha support by default in either WordPress backend or front end login. So your plugin should support captcha verification in login forms. Generally, we use reCaptcha or NoCaptcha by Google and many plugins supports it. You will need to check support for captcha. Also its ideal if your plugin supports multiple captcha verification libraries and flexibility to integrate any captcha plugin verification into login form. Social login is the modern way of logging into a site where you dont have to enter username or password. If you already login to your social network, it requires only single click to login to a site. Social login is not a must. However, many users will prefer login through popular social networks such as Facebook, Twitter, LinkedIn, Google+, Yahoo, Instagram. So its good idea to check whether your plugin supports social login along with normal login form. Once the user is logged in, you want them to be redirected to a certain post,page or URL. So its important to check the customizability of login redirection URL in your WordPress front end login plugin. Some plugins may allow global redirection URL for all the login forms while some plugins may allow setting redirection URL for each login form through shortcodes. Also sometimes you may need to change the redirection depending on the user role of logged in users. So make sure to check the availability of redirection URL’s. These are the most important features required in front end login plugin. Apart from these features, there are many additional features that enhances the functionality of your login form. Let’s take a look at the optional features of a WordPress front end login plugin. All the proper plugins will be providing validations required for username/email and password when login. However, you may need some special custom validations in some scenarios. For example, you may need to block certain email addresses from login or users with certain statuses from login to the site. In such scenarios its essential to have the ability to enable custom validations on login form. In some sites we need the ability to support additional login fields in login form apart from the common username and password fields. In such scenarios, we need the ability to enable custom fields in login form and validate them before users are allowed to login. This is not a common requirement and hence many plugins won’t provide such features. So make sure to check the plugin features in case you have such requirements. Most front end login plugins provide well designed login forms for front end. However, it may not fit with the design of all the themes. Also you may need to change the structure of login form to suit your site. For example, plugins may provide login form with multiple rows per each field. However, you may need all login fields and login button in a single row to reduce the height and save space. In such scenarios, your plugin should either provide different custom designs to chooose or let you create your own design. So make sure to check the flexibility of login form templates in your plugin when you want a perfect design. These are the most important features of a good front end login plugin for WordPress. It’s up to you to check these features and choose the right plugin according to your requirements. You will find many plugins specially developed for front end login as well as advanced plugins that handles front end login as one of the features. You can use pre-sales questions, support forums and test it on your own to identify the availability of these features. Personally, I recommend using a premium plugin if your requirements are beyond just using front end login. These premium plugins always provides better features, flexibility and support compared to most of the free plugins. In the next section, we will be looking at our User Profiles plugins and how you can use it to handle your front end login features. 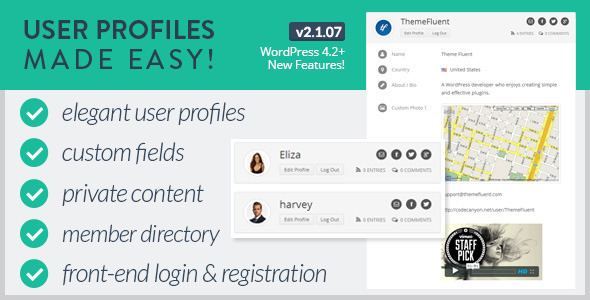 WP Expert Developer provides a plugin called User Profiles Made Easy. It provides features such as front end login, registration and user profiles. We highly recommend this plugin for your sites front end login as we can guarantee the availability of features, provide necessary customizations and support on any issues. In this section I am going to walk you through the details on how our plugin handles the front end login features mentioned in previous sections. This will be a good guide for comparing our plugin features with other plugins and know the available features in our plugin. UPME uses default WordPress wp_signon function to log the users into the site and hence you don’t have to worry about the security concerns generated from custom functions. Since UPME is using default WordPress functions to handle login, you will have support for all the default login filters and actions in the login process. UPME provides support for reCaptcha, No CAPTCHA reCAPTCHA, FunCaptcha and Captcha by Bestwebsoft. Each of these captcha verification libraries uses different techniques such as entering text, audios, drag and drop and calculations. Therefore, you have wide range of captcha techniques to choose. Also you caneasily enable/disable captcha on login forms. Following image previews various captcha techniques enabled in UPME login form. Apart from these default supported libraries, we also offer the ability to integrate login form with other captcha plugins through filters and actions. So you can easily integrate your favorite captcha plugin into front end login form with the support of a developer as customizations. Unlike most other plugins, social login is a built-in feature in UPME . 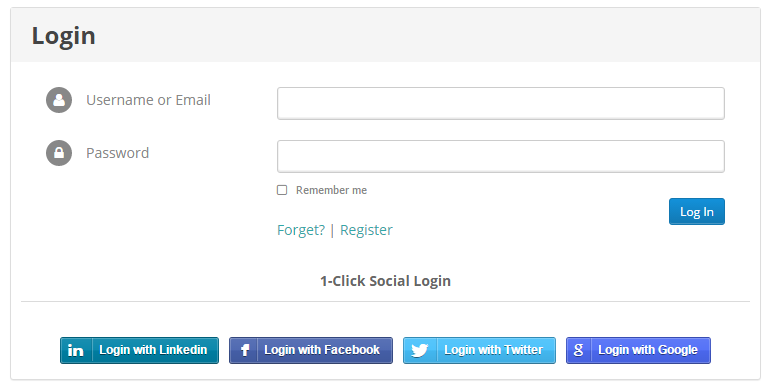 You can enable social login in front end for Facebook, Twitter, LinkedIn and GooglePlus. Following image previews frontend login form with social login enabled. UPME provides 4 built-in login form designs as previewed in the following image. You can choose one of those designs for each and every UPME login form. If you are familiar with WordPress development, you can easily create your own templates and use it with UPME. If not, you can always hire UPME developers to build a custom login template for you. UPME allows you to set global redirection URL for login form through settings. You can also configure different redirection URL for each login form through shortcode attributes. We don’t have role based login redirect as a feature. But you can easily implement it by using our filters for login. So the flexibility of UPME login redirection is very high compared to other solutions. We don’t provide settings to enable custom validations on login. However, we have well defined filters where you can do any type of custom validation through minor custom coding. UPME also supports additional login fields through filters. You need good WP development knowledge or get the support of a developer to implement additional login fields and verification to your login form. We feel User Profiles Made Easy is one of the few fully featured and flexible front end login plugins for WordPress. 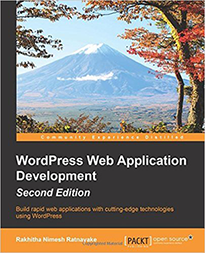 So we recommend it and provides support for anyone who wish to use it in a project. Check out the features of UPME here. We feel these are the most essential features for WordPress front end login plugin. If you think we have missed important features or you have better suggestions, please let us know through comments section. We would love to share those features and possibly add it to our User Profiles Made Easy plugin. This entry was posted in Plugins and tagged front-end login, UPME, WordPress login. Bookmark the permalink.